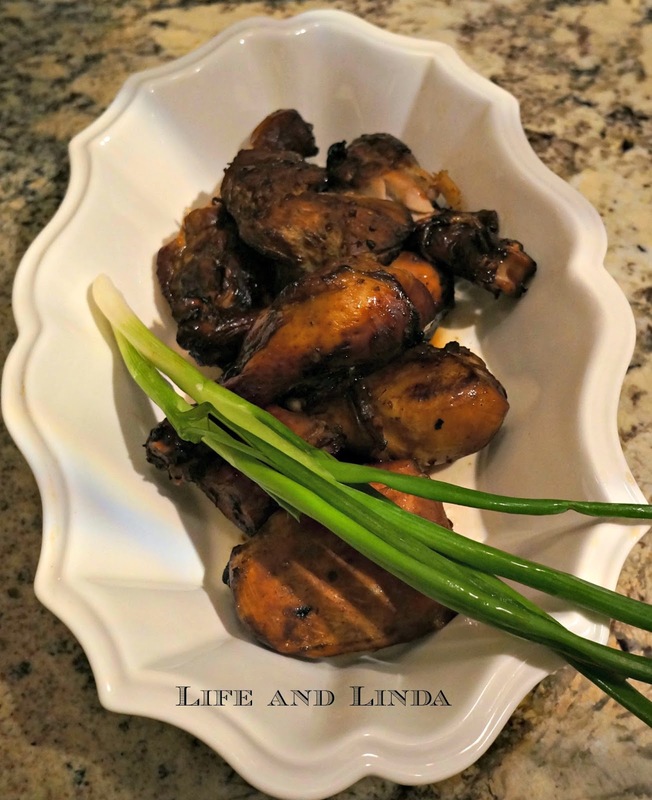 We love chicken so I was inspired to make a chicken marinated in ginger, soy sauce and garlic. I used thighs and chicken breasts. This dish is easy and you can either grill it or bake it. The marinate gives it a wonderful flavor. Cut the chicken into serving pieces.- 2 drumsticks, 2 thighs, 2 wings, quarter the breasts. In a bowl, whisk together, the garlic, ginger, 5 five spice powder, honey, soy sauce, onion, and red pepper flakes. Transfer to a large ziploc bag and add the chicken pieces. Preheat oven to 375. Line a baking sheet with foil. Spray foil with cooking spray to prevent sticking. Put in oven 375 and bake 35 + minutes until chicken is done. 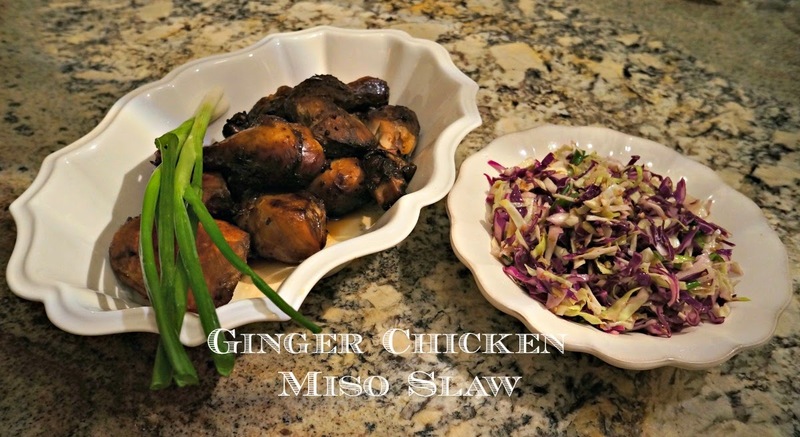 Serve chicken with Miso Slaw. In a medium bowl, whisk the sesame seeds, rice vinegar, miso, ginger, salt, & pepper. Add the sesame and canola in a steady stream, whisking constantly, until emulsified. Add the red and green cabbage and toss. Refrigerate at least an hour. Happy Eating! A bright New year. I shall be posting our laundry room with the tiled backsplash soon. I now have a new look for my blog...Any feedback? Hi Linda, oh my goodness this looks and sounds so good!! Now I'm hungry!! Thank you for sharing the recipe. Wishing you a Happy New Year filled with many blessings. So glad I met you last year and look forward to many more fun visit here!! Mmmmmm! Lots of oriental goodness in those dishes! This would be close to my perfect dinner. I need to try both of the recipes. We would enjoy this dinner Linda. Love when you revamp blogs, and look forward to your update. Wow that looks and sounds good! I printed it off and will try it! THX for sharing it! Looks & sounds delish, Linda! I don't think I've ever eaten "miso" anything. LOL Willing to try it, though. I look forward to seeing your laundry room's tiled backsplash shots...you have such a beautiful home, it is hard to imagine that it needed any changes. Same goes for your pretty blog, too!! Absolutely delicious recipes for us today! Can I come over for dinner? What a perfect, healthy meal for starting the new year, Linda. I look forward to your laundry room reveal and your blog update. Happy New Year hugs sent to you. These look really nice! Happy New Year too! Oh Linda, when I came here the other day, I was on my little tablet and did not even notice the gorgeous new green color of your layout here! LOVELY!!!! Oh my Linda...this recipe sounds yummy! I LOVE your new look here on your blog! Everything looks so fresh and beautiful...cute peacock - so glad you could use it. Your new blog design is fabulous. The colours and layout are so well suited to you and your photos really shine. I'm such a big fan of ginger with chicken and this will be a great healthy game day dish. 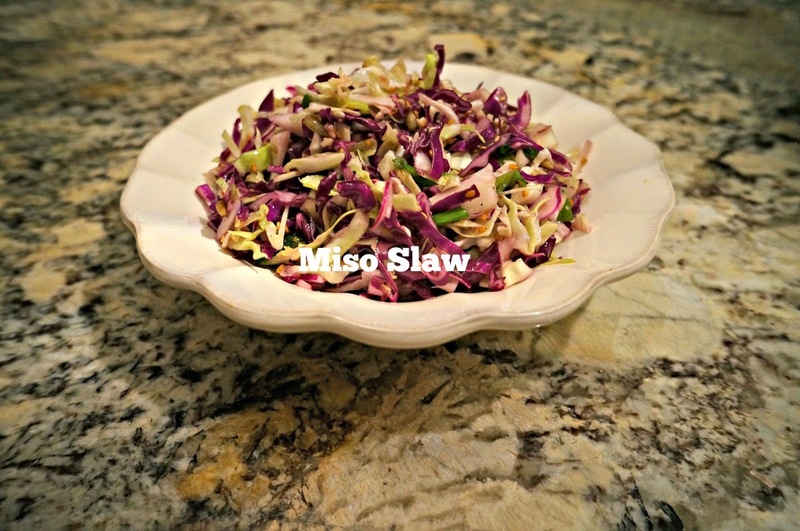 I'm not particularly a slaw fan, but this recipe does sound good! Hi lovely lady. It's been a long time not on your new blog. I will have to put this recipe together for dinner some time. Call me some time OK.